The Freemasons use all kinds of symbols to represent the practices and beliefs of their order. Many of these Masonic symbols originate from the masonry trade and the Christian Bible. Scythe and hourglass: The scythe is to remind Masons of the ever-present danger of death that awaits us all. Like the scythe, the hourglass is an emblem of mortality. The Pythagorean theorem: The most useful mathematical equation for use in the building trade, the Pythagorean theorem was one of the biggest secrets of the early stonemasons. Jacob’s ladder: In the book of Genesis, Jacob dreamed that he saw a ladder stretching from Earth to heaven, and angels climbed up and down it. In Masonry, the ladder is described as having three main rungs, representing faith, hope, and charity. Other rungs include temperance, fortitude, prudence, and justice. Taken together, these rungs are the guiding virtues of Freemasonry. Anchor and ark: In the lectures of Masonry, the anchor and the ark are combined as symbols of a well-spent life. The anchor is a symbol of hope, and the ark (like Noah’s boat) is an emblem of faith. Sun, eye, moon, and stars: These images are combined to describe God, whom the sun, the moon, and the stars obey. The sun and moon are also to remind the officers of the lodge to govern the lodge with regularity. Lamb and lambskin apron: Moreso than any other other symbol, the lambskin apron is the universal badge of a Mason. Aprons, girdles, or sashes have appeared throughout history as symbols of honor, piety, or achievement. Slipper: This is a symbol relating to the way candidates are prepared for the degrees. The Masonic explanation comes from a Hebrew custom of removing one’s shoe and giving it to a neighbor to seal an agreement, as a promise of honor and sincerity. Point within a circle and parallel lines: This tiny symbol is one of the most confounding images in Freemasonry — no one really knows what it means. It’s a circle, with a point in the middle. On top of the circle is a Bible or Volume of Sacred Law. On either side of the circle are two parallel lines. Pot of incense: Incense is not typically burned in a Masonic lodge, but the symbol of a pot of incense is used as an allegory for a pure heart (the pot or censer) and the prayers that arise from it to heaven, symbolized by the clouds of rising smoke. Beehive: Bees have long been a symbol of hard work and teamwork. To the Mason, the beehive is especially fascinating, because the honeycomb is a perfect geometric structure. Plumb: A device with a string and a weight at the bottom (called a plumb bob) to help a workman determine if a vertical wall or surface is level. 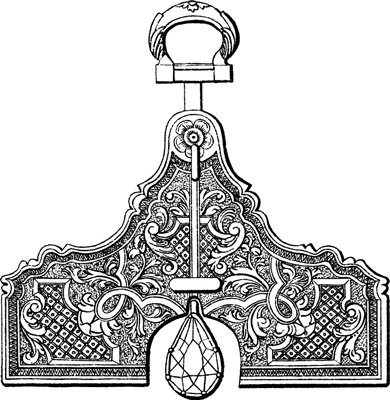 The plumb line always points to both the center of the Earth and to the heavens. It’s a symbol of justice, rectitude, uprightness, equity, and truth. Level: A building tool similar to the plumb, the level measures the levelness of horizontal surfaces. It reminds Masons that they’re all living their lives upon the level of time. Five-pointed star: The five-pointed star is another emblem representative of God. Naked heart and the sword: The heart has a sword pointing to it, while the symbols of God look down from above. The heart and the sword symbolize justice. Tyler’s sword and the Book of Constitutions: The Book of Constitutions is the code of Masonic laws that govern the operation of lodges. The Tyler’s sword across it is a caution to protect the institution of Freemasonry by guarding against unworthy thoughts, deeds, and words that may bring the fraternity into bad repute. Trowel: The trowel is an instrument that’s used to spread cement or mortar, which binds bricks together. When joined together by the ceremonies and practices of Masonry, the individuals will work together to help each other and society as a whole. Handshake: A symbol of two hands shaking is representative of the grip or token of a Freemason, the way members may recognize each other in silence. Rough and perfect (or smooth) ashlars (quarry stones): The rough ashlar represents man in his rough, rude, and imperfect state. Masons are taught that by education, culture, discipline, and faith, they can become a more perfect person, like the perfect ashlar. 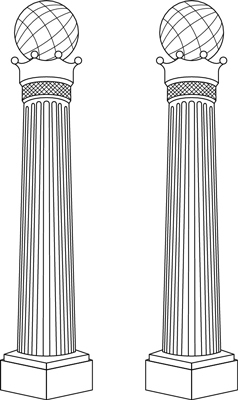 Pillars: In the course of the Fellow Craft degree, the candidate passes between the two pillars on his symbolic way into the Middle Chamber of Solomon’s Temple. Individually, they represent strength and establishment. The coffin, shovel, setting maul, and sprig of acacia: The symbols of the grave remind Masons that everyone shall eventually die and turn to dust. The hearty acacia plant, which thrives in the Holy Land, can often seem to spring back to life from little more than a dead branch, and reminds us of the hope for immortality that unites all religions. 24-inch gauge and the common gavel: The 24-inch gauge is representative of the 24 hours of the day. The gavel is to remind Masons to endeavor to remove the rough edges from their own character, to become more like the perfect ashlar.